Premium Horizontal Closure for up to 16 output drop cables from the same box. It is ideal for installing on walls, suitable for outdoors. Made from high quality waterproof and dustproof material (PP), with anti –UV and treated against aging; IP65 protection. Premium Horizontal Closure for up to 16 output drop cables from the same box. It is ideal for installing on walls, suitable for outdoors. Made from high quality waterproof and dustproof material (PP), with anti –UV and treated against aging; IP65 protection. 1- It has 8 Input Ports/output for fibre for up to F12mm and 16 Output Ports for subscriber connection with airtight plugs for fast SC type installation. 2- Shut with double pressure clips and two screws for enhanced airtight sealing. A security padlock may be fitted thanks to slot on the side. 3- It includes 3 trays for up to 60 Fusion Splices and a capacity to house y 2 PLC Splitters, these can be flipped up to access a fourth tray. 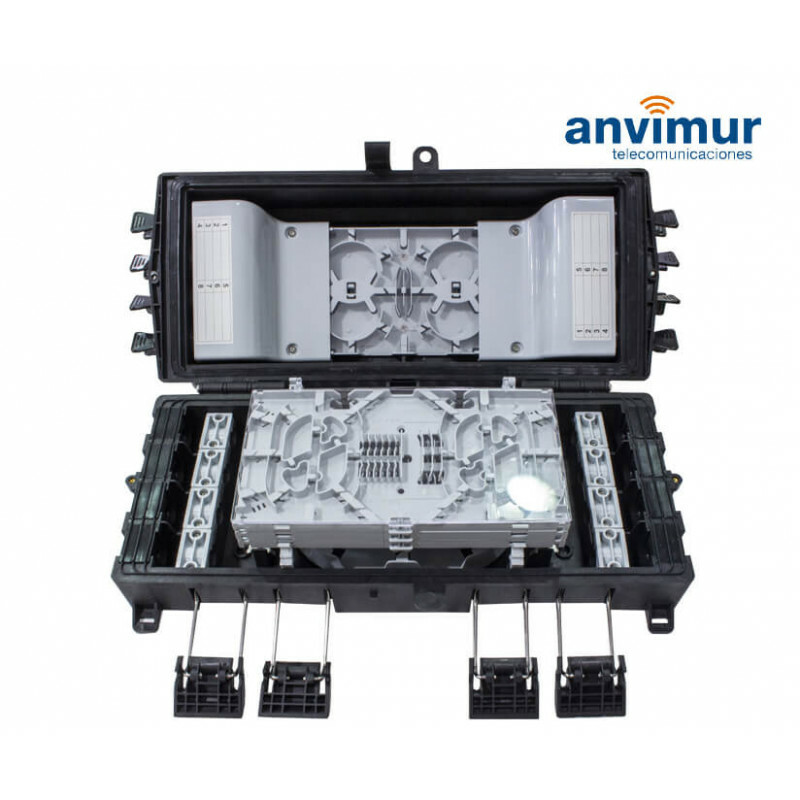 5- It includes a tray for installing and distributing of up to 2 pre-connected PLC Splitters for connecting subscribers without opening the box. 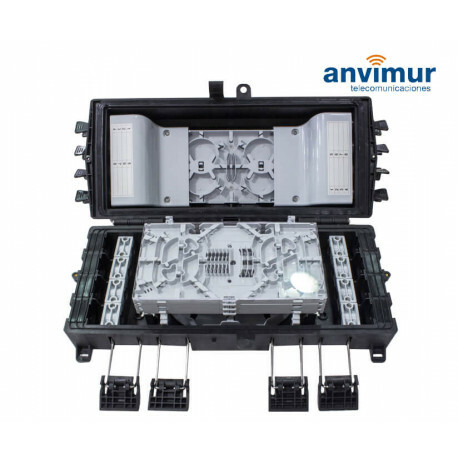 6- It includes universal airtight connectors for outdoor drops. 7- It can be installed directly to a wall with the plugs and screw that come with the accessories. 8- It includes all the istallation and mounting asscesories.